After the popular X5C quadcopter, Syma finally released the new quadcopter drone. The latest Syma quadcopter drone is the Syma X13. Banggood list the dimensions on the X13 to be 15.6 x 15.6 x 3.6 cm whereas the X12 measures 7 x 4.5 x 2.65cm. You might think a little expensive for a micro quadcopter drone, but that is not the case. 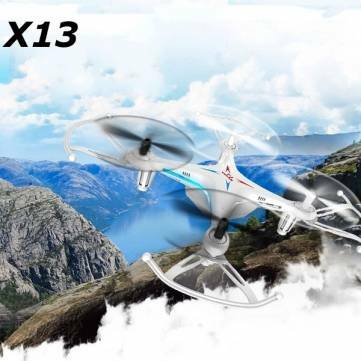 Syma X13 is only $26.99 in Banggood, which will certainly be appealing to many. Regarding the specs, it comes with a 200mAh battery which can support about 5 minutes' flight. The 200mAh cell takes about 70 minutes to charge according to the listing. Syma X13 is available in three different colors, namely white, red and black.